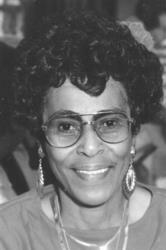 Mrs. Barbara Bailey Williams entered into rest Tuesday, November 27, 2018 at Azalea Health and Rehabilitation Center in Augusta, GA.
Barbara leaves to celebrate life, a devoted daughter, Mrs. Andrea C. (Charles) Johnson; devoted brother, Mr. Robert (Sandra) Bailey, Jr.; devoted granddaughter, Mrs. Keisha J. (Corey) Cole; great grandsons, Mr. Eric Grant and Mr. Corey Cole, Jr.; brother-in-law, Mr. Wilbert Gallop; nieces; nephews; great nieces and nephews; and a host of other relatives, godchildren and dear friends. Funeral services will be conducted Saturday, December 1, 2018 at 11:00 a.m. from Bethel A.M.E. Church, 623 Crawford Avenue, Reverend Augusta H. Hall, Jr., pastor-eulogist. Interment will be in Walker Memorial Park. The remains will lie in state at the church from 10:00 a.m. until the hour of service. God bless the family at this time of sadness. We will keep you in our prayers. Barbara was a devoted neighbor. Andrea is a loving daughter. God has plucked a rose.